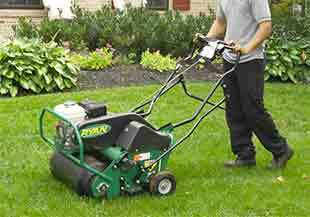 EnvisiaCare Services offers full service lawn care for Cheyenne residents and surrounding areas. 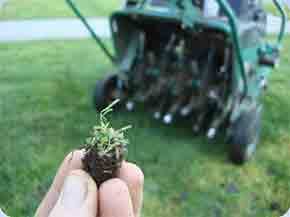 Core aeration constitutes an important part of turf management, especially given the climate in Wyoming. If you're unfamiliar with aeration and the purpose behind it we can help. The primary purpose of aeration is to reduce soil compaction. It also allows water, air, and nutrients to better reach the roots of your lawn. This allows for a stronger and healthier root system and a healthier and greener lawn. Aeration involves a lawn aerator which perforates the lawn with small round holes and pulls the resulting "plugs" of grass to the surface of the lawn. These cores are left on the surface to be broken up by irrigation, mowing, and rainfall. Lawn aeration does not need to be done very frequently. Generally once per year for a healthy lawn or twice per year if your lawn is compacted, needs overseeding, or is in recovery. The best times for aeration in Cheyenne are spring and fall, although anytime when the ground is not frozen is fine. Fall is beneficial because as you winterize your sprinkler system and quit watering your lawn, the grass suffers. Even throughout the winter grass and trees need water. Aerating in the fall helps your lawn retain more of the natural moisture that falls on it over the winter while it's not getting irrigated. Spring is another great time, mostly for the same reasons. Before you turn on your sprinkler system in the spring we get quite a bit of natural moisture, but much of it runs off. Aerating in early spring allows your lawn to benefit much more from the snow and rain showers in March, April, and May. Whatever the season, we're the company to call for your outdoor maintenance service.